It's roundup tiiimeeeee!!! 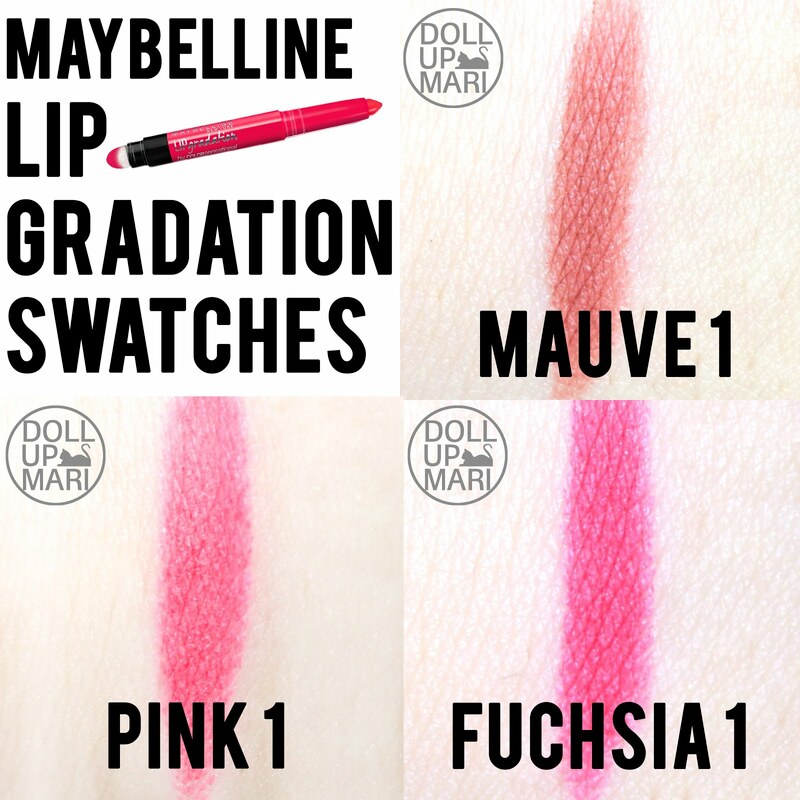 I now have with me the complete verdict over Maybelline's Lip Gradation lipsticks. You have already seen my review for each shade, so I thought it's time to give a general verdict on them. First up, I got three shades, namely Pink 1, Fuchsia 1, and Mauve 1. There are several other shades, namely Coral 1, Pink 2, Orange 1, Red 1, and Red 2. 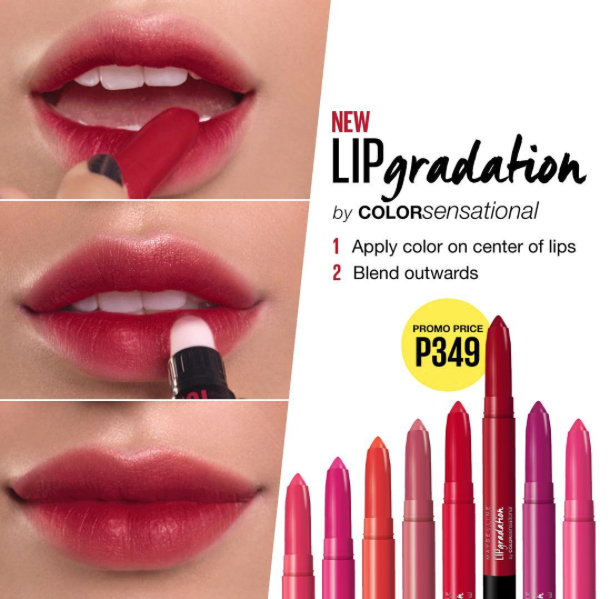 They're called Lip Gradation lipsticks here in the Philippines, but in other territories you may see them as Lip Blur lipsticks, perhaps because there is no trend of gradation lips in those territories. 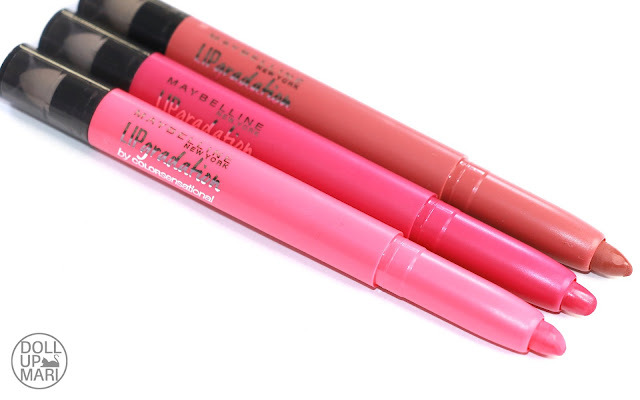 Lasting power wise, these have lasted on me very well, whether as gradient lippie, lipstick, or tint. I like that I can apply this in the morning and I'd still have color on my lips in the afternoon. I was further able to see the lasting power this whole two weeks as I've been hit with the toughest cough ever (the kind of cough I'd wish my enemies would have HAHAHA). Because of my cough, I of course, obviously, cough frequently. But I also wipe my nose and mouth area more frequently due to my illness. The tint of these lippies would last on me for a good 7-8 hours in the daytime despite all the wiping I did. I was actually first amazed when I decided late in the evening to try this out. I applied it really thickly on my lips, and I was like "Imma Kylie Jenner" this thing, and so I overlined it and everything. I wiped it off carelessly and just wiped the whole thing to the left, and lo and behold, there was a very visible pink stain on the left side below my lips! I took a bath, washed my face, brushed my teeth, and slept with that. When I woke up and brushed my teeth and washed my face again, it was still there! It only officially got off when I already coughed and coughed a lot and wiped it off on purpose with baby oil. 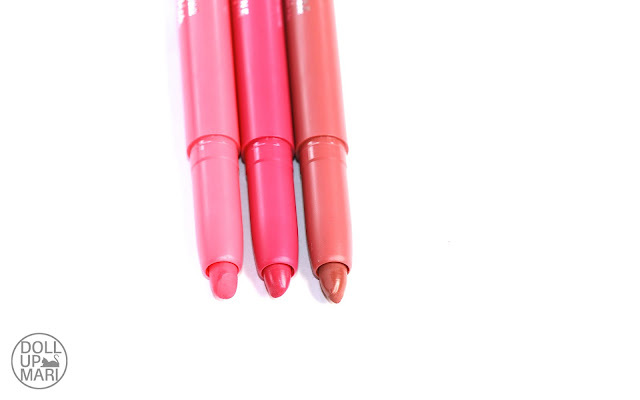 Comfort wise, the comfort of any gradation lippie depends on the other products you will or will not pair with it. In my case, since I have very dry lips, I really need to top my gradation lippie with lip balm or else my lips really will flake up. For the people with generally OK lips, you can pair this with concealer, lip gloss, foundation, and the like, and it will be fine. As a lipstick, this is generally comfortable and it's easy to go through the day using this as it feels like a wispy, powdery lip balm. Honestly, you're probably going to catch me using this as lipstick more than as gradation lippie because of how much I like the texture hahaha. So this is the packaging. Like in my previous posts, it's basically a two sided tube, with the lippie coming out on one side and the sponge on the other side. The sponge is their latest technology slash convenience slash hack so that you can easily blend the lippie in to get that gradation look. My comments for improvement are a lot on the packaging part. 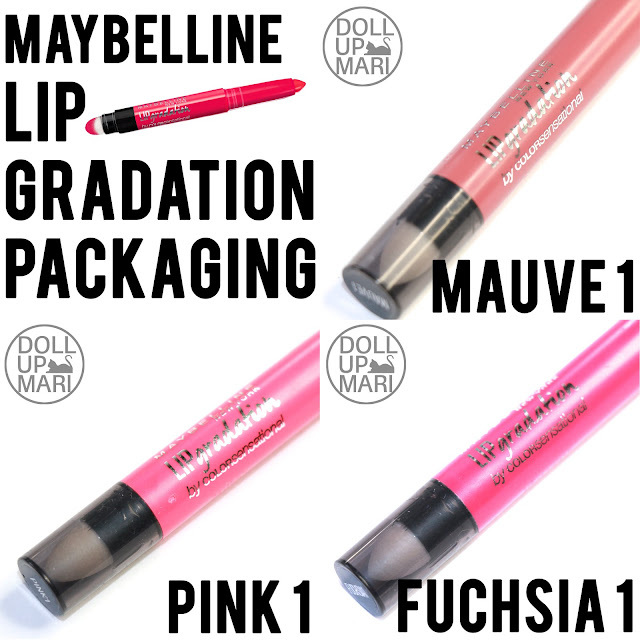 For one, since the shade name is published on the lid of the sponge side, there's a big chance that when you're rushing and you happen to have very similar shades of lip gradation, you're bound to mix up the shade names. It would have probably been better that aside from the lippie's body reflecting the color of the lippie, the shade name could have been printed there to make it less confusing. The sponge itself seems to have no replacement, so everyone should be careful on how they will use their sponges. Avoid using it on other people or when you're sick. I have tried to pull the sponge out, but to no avail, since there are spikes anchoring the sponge down. I didn't attempt further because I might rip the sponge instead. And for those of you who have the tendency to play with things when bored, this is not the right thing to play with as the product is dispensed by twisting the sponge side, not the lippie side. As such, if you play with it at random, you may accidentally spin the whole thing, and that's not a good thing. And these are the swatches for the shades that I got. Mauve 1 is a leather brown shade, perhaps the best subtle dupe for Kylie Jenner Lip Kit in True Brown K.
Pink 1 is a warm rosy pink with a tiny, tiny, touch of coral. Fuchsia 1 is a pinkish orchid shade. Of course, there are many, many ways to play with these lippies. You can play around with concealer, lip gloss, and lip balm, or just use the product alone. You can also use it as cheek tint! It's got the perfect texture to work as cheek tint because it's not too hard and it's not too emollient, so you can expect it to blend easily but not spread like crazy once it's on your cheeks. Overall, I generally think that these are good products that many people will like. There are already a lot of people in my circles who have gone out to buy this for themselves this early on, so I do think that this is a product that the general public has received very well. I personally will recommend this because of how versatile it is and how many ways this product can be used.